Let’s define what a faucet is. They are an essential component for draft beer and without a proper one, you would not be able to pour a beer efficiently. Good faucets also keep your tap sanitary and contribute to a food-safe environment. Many people confuse a faucet with the tap itself. However, it is actually at the end of a tap. This is where the beverage exits and enters your glass. As it is the last contact point, it is essential to consider its effects on a beer. They help to direct the flow of beer. There are many different beer styles and they may require different pouring methods. If you aren’t careful, you can end up with too much head and waste brew as it foams out of the glass. It will also take you longer to serve the next customer if you are spending unneeded time managing each glass. If you are interested in purchasing a new kegerator tap, or upgrading your current once, you definitely need to read my review below. Beer, wine, coffee, water, etc. The Perlick 630SS faucet is my favorite by far. 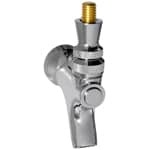 It is made from extremely high-grade stainless steel so you won’t have to worry about wear and it has a patented forward sealing design eliminating the need for a valve shaft. The spout angle and polished finish of this faucet also keeps the beer from collecting inside, which almost eliminates the chances of drips. This will also help to keep the tap from sticking. Aside from the thoughtful design, it is also very sleek looking and well-polished. Recommended if you like the best-of-the-best. This is another standard faucet. However, this is made of high-quality stainless steel. It has a very smooth polished finish and with SS304 grade stainless steel that is built for commercial quality. It will also fit standard North American shanks and towers and is designed to keep a smooth action on both. Inside of this steel unit is a high-quality Teflon ball washer to ensure smooth operation. This piece can also be used for both your brew and wine. 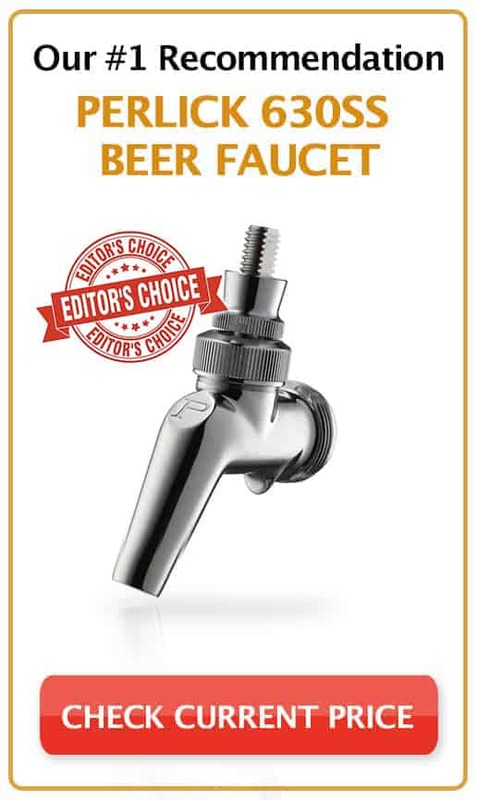 This is more than just a draft beer faucet. The package includes a 4-inch shank kit, tap handle, and faucet. The shank kit can be used to attach the faucet to the beer lines, and the handle is conveniently attached. The handle will undoubtedly get the job done, but if you wanted to put something more decorative or customized on then, it could easily be removed. It’s made of chrome plated brass mold and shines bright when kept clean. This piece works just as well as any other and is a great buy including the shank kit and handle. 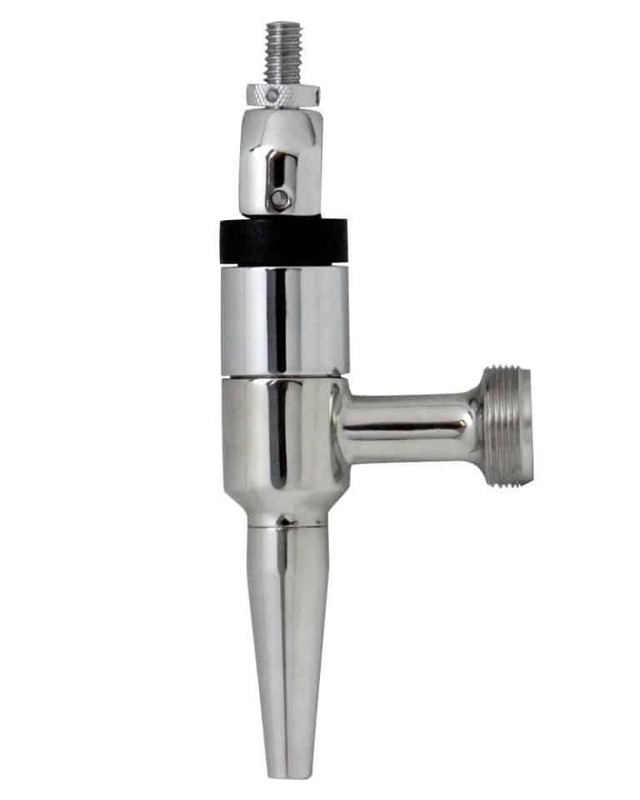 This is a standard draught beer faucet. 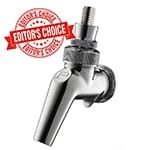 It is perfect for pouring almost all brew styles (including homebrew) and will easily attach to any North American shank (traditional bar tap) or tower (kegerator). The chrome plating is a sweet finish and shines brightly. I do recommend keeping your beer tap very clean primarily because they can start to stick if they aren’t cleaned daily. However, that is no problem as this one makes it very easy. It is small and has smooth edges where brew can’t hind behind. Nitro beers have been growing in popularity. They are known for their smooth feel and thick head. Guinness is probably the most famous nitro beer, but there are many others such as Founder’s Oatmeal Stout and the Left Hand Milk Stout. This stout faucet is specifically designed to pour these beers. 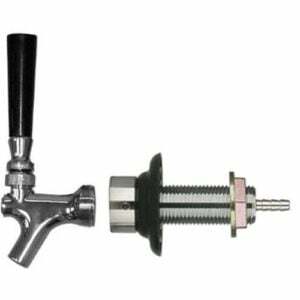 It is different than a standard tap in that it can regulate the speed of the pour and has a narrower end. This ensures that you aren’t producing too much head and enhances their aroma. 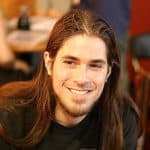 Interesting information right? Stout Faucets can be attached to most standard shanks, towers, and handles. Two of the most common beer faucets are standard and stout. 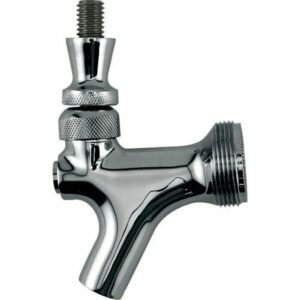 Standard faucets are the most common style that you are used to seeing at a bar, restaurant, or on a kegerator. They are designed to pour most beer styles. This list includes lagers, IPAs, meads, stouts, ciders, and more. Standard beer tap faucets are high for any occasion. You will not have any issues pouring traditional ales and lagers. They are easily attached to most shanks and towers and typically don’t require any line adjustment. Although these they are versatile, they aren’t always the best option for nitrogen beer – they are known to be heavy with a thick tight head. 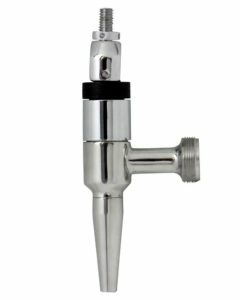 Stout (Nitrogen) faucets are designed to manipulate the speed of a pour to more easily regulate aromas, head volume, and retention. Stout faucets are only for nitro beers. They are great at what they do, but you won’t have an easy time pouring CO2. Once you have chosen the perfect faucet for your homebrewing needs, you can also check out our recommended equipment list and beer making kits. Of course, if you are planning on pouring nitro, then you should go with a stout faucet. However, for all practical purposes, I would recommend going with the Perlick 630SS for everything else. It has a forward-thinking design that is more efficient than most standard faucets. It also dramatically reduces the chances of dripping and sticking. If you apply too much pressure on a sticking faucet, you may end up breaking an internal component. This is especially true for most home setups.